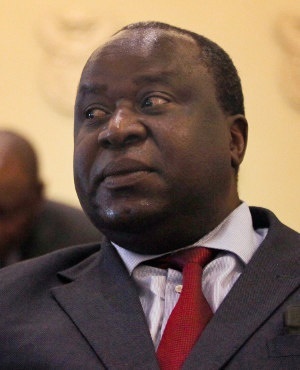 Minister of Finance Tito Mboweni told reporters on Wednesday that, if President Cyril Ramaphosa gave him the power to decide, the size of Cabinet would be reduced dramatically to 25 or ideally 20. He was speaking to reporters in Parliament ahead of the tabling of his medium-term budget policy statement in the National Assembly on Wednesday. Ramaphosa and Deputy President David Mabuza have already hinted that work in “reconfiguring” the size of Cabinet to make the executive more efficient was already at an advanced stage. When asked about the size of Cabinet in the view of reducing government spending, Mboweni told reporters the ideal Cabinet size for a country like South Africa was “preferably not more than 25, but ideally 20”. “China is a large economy and does not have a cabinet as large as ours in proportion to the size of the economy. We have no economically viable or logically understandable reason to have a Cabinet with a size of close to 70 members, if you include deputy ministers,” said Mboweni. He said that, it he hopes to achieve anything in National Treasury, it would be to “offer political protection to National Treasury and de-politicise” the institution.